Instagram is returning to Edurank. How can you get it? It’s the news that all education marketers have been hoping for. Instagram data, both monthly and daily, has returned to Edurank. Yes, we can’t contain our excitement either. But thanks to our team of technical geniuses we are able to get obtain the relevant information from Instagram to power Edurank and share it with our loyal users. Instagram is one the biggest social media platform for the student market, so its return is going to be instrumental for all education marketers, who use data to perfect their social media strategies. So that your Instagram data can be collected and included within Edurank, you simply need to make sure your institution’s Instagram account is set to a business one. It’s super easy and is literally just the click of a button. There will be a few settings to follow, but then you’re done! Edurank is then able to ethically obtain the data to use within the ranks and the daily data which is available on Edurank Enterprise. What are the benefits of a Business Profile? In an ideal world, every institution’s Instagram page should already be tagged as a Business Profile. So, apart from your Edurank insights, here’s what else you’d get from having a Business Profile. Advertising: You’ll be able to use Instagram’s advanced advertising features, which has a variety targeting options – to make sure you’re messaging is reaching the type of students. Speak to our friends over at Net Natives for more information on Instagram advertising, they’ll make sure you get the most from this feature. 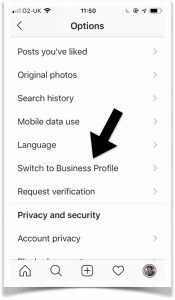 Story links: If you’re down as a Business Account, and you get more than 10,000 followers, you will then be able to add links at the bottom of your Instagram stories. This will give your University or College the opportunity to promote a specific course, linking out to bespoke landing pages. Contact button: Once your profile changes over, a ‘contact button’ feature is installed on your profile. This is a great opportunity for people to contact you via phone or email and make a direct enquiry to your institution – this could help your conversion rate improve. Please get in touch if you have any questions when swapping your Instagram account. We can’t wait to welcome this social media platform back to Edurank, and look forward to seeing what you’re all doing on the image based platform.